Welcome to our webpage! Here you will have the opportunity to learn all about Thrips tabaci, more commonly known as the Onion thrip. 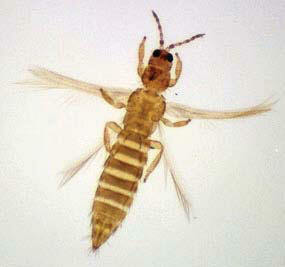 It is a key insect pest in most onion production areas of the world. They spend the winter protected under plant debris and plant parts. When temperatures get warmer, adults fly to new onion fields, where they begin feeding and destructing. Long-term, sustainable management of Onion thrips includes crop cultural practices, onion varietal resistance, biological control, and insecticide resistance management. However, they are prone to develop resistance to these control measures, especially against insecticides (Utah State University Extension 2008). Learn more about damage and control. Let's first begin with the Classification of this organsim!